A wide, rounded tree with green summer foliage that turns tones of red in the fall. 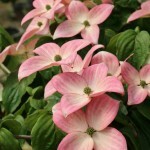 The large, long lasting bracts are dark pink to rose pink, the color being influenced by the season. 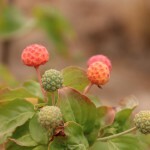 It will also produce red fruit in the fall. The bark is exfoliating. Prefers moist, well-drained acidic soil. Selected by Jim Schmidt of Don Schmidt Nursery. PP 9,283.